Social work employers and educators must do more to ensure practitioners are supported in handling emotional distress, according to sector leaders. 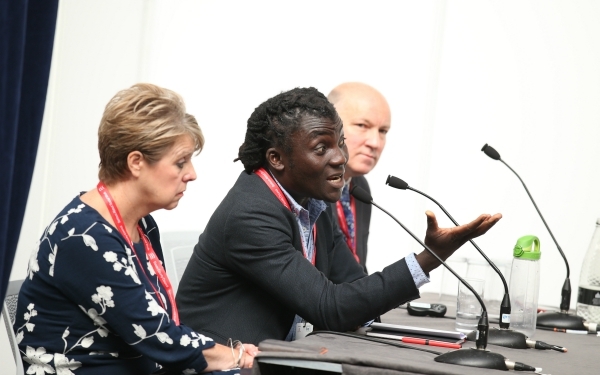 Speaking at Community Care Live on the issue last week, Paul Angeli, assistant director of children’s social care and youth inclusion at the London Borough of Merton, said emotional distress was at the core of all social work, but employers and managers did not take it seriously enough. He said senior managers often switched off from it as part of an organisational defensiveness because they weren’t sure what else to do. Instead they should be ensuring they were noticing social workers in distress and the organisation was equipped and able to help them manage it. He added that emotional distress did not just have a mental impact on workers but there was often a physical impact as well from adrenalin, anxiety and feeling tense. Louise Grant, head of school for applied social studies at the University of Bedfordshire and a leading researcher in the field of resilience, said social workers were often taught to be very self-critical as part of their reflective practice. Grant said organisations needed to create the right conditions to help social workers recover from difficult experiences and one way to do this was to act as a secure base for social workers to return to. Godfred Boahen, policy and research officer at the British Association of Social Workers (BASW), said the nature of some of the incidents social workers experienced was traumatic, and yet many social workers feared telling their managers in case they were reported to the Health and Care Professions Council (HCPC). Responding to a question from the audience about poor resilience to distress among newly qualified social workers (NQSWs), Grant agreed some academic institutions were not screening course applicants rigorously enough. “There are key competencies and capacities that social workers need in order for them to be able to manage difficult situations, and not all social work education provision actually encourages or assesses for them when recruiting to courses. Angeli also made the point that many NQSWs in children’s services were recruited to roles where they were likely to experience the highest levels of emotional distress, such as in referral and assessment or safeguarding teams. The panellists also agreed social workers had responsibilities in this area such as understanding their own responses and needs, being kinder to each other, encouraging group supervision or peer support in workplaces and helping managers understand what were helpful and unhelpful responses. I am interested in LouIse Grant’s assertion that being able to communicate reflectively is not a competence that can be taught but is inherent. I would be interested in the research she cites to support this. I do think this is a competence that can be developed and should be in all social work courses. I seem to remember the phrase ‘use of self’ from my own social work training (quite a few years ago now) and how important it is that social workers have an appropriate understanding of what this means in terms of understanding the emotional impact working with people in distress may have on us and where these feelings might have come from. Supervision should also be used to support the development of social,workers ability to reflect on distressful situations and the emotional impact of these situations both on themselves and on the people they work with. This was a great read. As a mature newly qualified Social worker, who is yet to work out where i want to practice. I have always had a sence and it it is just my own opinion, that due to high levels of cases in todays world of social work,you worry a great deal about where will you find the time to even think for yourself? . let alone feel supported. Everyone is busy… just because.On a good note on one of my placement and in a role,when i waas provided clinical supervision along with full time staff. This was from an indepentent body. This was most helpful, and resfreshing as it allowed a safe place to off load. Although, i can only guess it is costly to the organisation. As a union steward I often pick up stress in Social Workers – usually after they have been put into capability proceedings due to sickness or poor performance at work. Most employers will say they are there to support their staff with emotional issues, but this always comes with the caveat that it mustn’t affect their ability to take on more work and more stress. Once a Social Worker starts to fall behind on the treadmill, management becomes and additional source of stress, rather than a solution. I have conducted research in this area myself. Particularly on the opportunities NQSWs get to unpack vicarious trauma. The findings showed that sadness was the strongest emotion felt but they had not realised this until asked. This was conducted under Paul’s leadership when we both worked in Southwark. We were able to review our supervision policies and I designed and delivered particular training and coaching on this area for staff. As a result, I often deliver sessions on self care, use of self, mindfulness and emotional intelligence and resilience with students, practice educators and managers. This is what can happen when you invest in your staff. Managers lack emotional intelligence, empathy & understanding! They don’t care if their SW’s are distressed, overworked or traumatised! They just expect you to get on with the job! The mental health of Social Workers must be taken very seriously, there are good, bad and indifferent managers in Social Work, and the level of support often varies. Social Work is an emotionally distressing job and employers should afford their Social Workers the care that is so often needed to ensure that their mental health is protected whilst in employment. I’ve been in Children’s Spcial work for 5 years and I found the stress incredibly hard to bear. I have had several periods of sickness. In July this year I felt I could not go on any more and quit. I am now unemployed and feel emotionally unable to do any job. My stress threshold has been reduced to nothing from constantly feeling worried, I’m on anti depressants, and have no confidence to seek employment. Spcial work was my big mistake. I expect there are many social workers and ex-social workers who will relate to your experience Chris. I left social work after 11 years in C.P as the job became overwhelmingly stressful and wore me down. I had 3 months out of work and used the time to self -care and reflect. I have found employment outside of social work and I feel like a different person. Look after yourself and hopefully, in time your confidence will return and you will be ready to work in a role you will be happy with.